More a ship than a liveaboard dive boat, the Solitude One Philippine liveaboard is 52 meters (171ft) in length with an 8.6 meter (28ft) beam with four decks. She was built in 1979 but underwent a complete and extreme overhaul in 2013 turning here into the luxury liveaboard dive boat she is today. She offers 10 comfortable fully furnished cabins with air-conditioning, en-suite bathrooms with hot and cold water, and in-room entertainment systems. She takes a maximum of 22 guests on board and divers the best areas of the Philippines included Tubbataha Reef, a UNESCO site, and Apo Island off Dauin, near Cebu. She carries safety equipment for safe passage at sea including first aid kits, Oxygen, a DAN oxygen kit, SOLAS life rafts, and SOLAS life jackets for both adults and children. 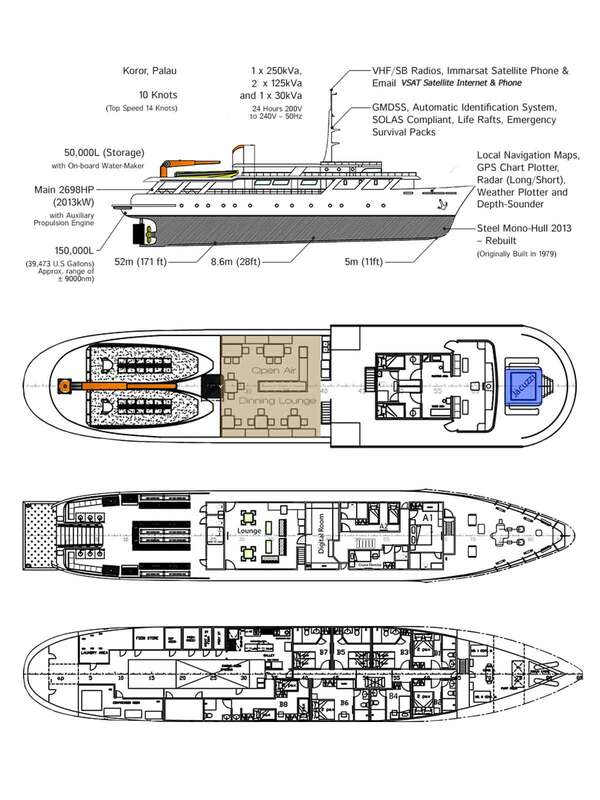 Her communication gear includes VHF/SB Radios, Fleet Broadband Satellite Phone & Internet, and Inmarsat-C. She carries 50,000 liters of water, but can make more from her watermaker. She has an effective cruising range of 9,000 nautical miles. Nitrox is available on board. She has a Jacuzzi on deck. The MV Solitude One liveaboard Philippines has 10 guest cabins including two staterooms with king beds and a day bed, seven deluxe cabins with either double beds, twin beds or bunk beds, and one family style quad cabin with twin beds and bunk beds. The stateroom day bed can be converted for a child under 12 years of age. She has a total of 12 bathrooms on board complete with hot and cold showers. Like most Philippine liveaboards, the MV Solitude One uses skiffs to whisk you to the dive sites while the mothership stays at anchor or moves to another site. Solitude One Philippine liveaboard has two two-engine 37ft skiffs which cruise at 27 knots, plus a support skiff. All tanks and heavy gear are handled by staff. The dive guide ratio is no more than 6:1. You’re allowed up to four dives per day. The digital darkroom was given as much consideration in the overall design of the vessel. Occupying premium space on the ‘A’ deck, the space is purposebuilt for safely stowing, prepping, and working on camera and video equipment. Two computer terminals are available if you want to leave your laptop at home and there are plenty of charging stations with 110v and 220v for international use. There are four rinse tanks with air-gun and towels just for cameras. Solitude One operates in Palau and the Philippines. Most of her trips are eight days in length though she is able to stay at sea for weeks at a time and offers some special crossings trips for up to 20 days. She is available for individual bookings as well as charter cruises. Individual prices are listed below in the schedules. Please contact us for charter prices. All Philippines departures are from the destinations nearest port. Usually this is Puerto Princessa or Cebu but check with us before booking your domestic flights. Solitude One’s staff are happy to pick you up from the airport and take you to the vessel. Transfer times are usually short. Domestic flights are easy in the Philippines with any number of airline choices. Upon trip confirmation we will send you a list of ideal departures from Manila. Nitrox: $8.00 Per Fill. Packages available. If you’re arriving Koror after midnight on departure day, the boat’s staff will meet you and take you to the boat for immediate boarding. Transfer times are only 30 minutes. The last passengers may board as late as 10AM the following morning. However, this is not recommended as you’ll feel rushed. Best to get in the day or more before. Three dives and your last dive has to conform to our 18 hour no‐fly policy. Please note: You may depart the vessel anytime on the last day. Approximately 23 dives. The Solitude One offers seven and 10-night itineraries from November until March each year. Above is a sample seven-night tour. For detailed itineraries, check the trip you’re interested in on the schedule below and we’ll email you the full itinerary. Itineraries are for general information only. We make no claims to being 100% accurate as there are too many factors affecting the schedule. We will give you the best diving on the best spots we can each day.